After spending 2 weeks holiday back home near Avignon at my mum’s recently, I’m all about summer Mediterranean vegetables at the moment, and this recipe is a great one for transporting you to Provence…. If your kids (or big kids) aren’t a big fan of their greens this dish may help you to sneak them onto their plates. It also happens to be a cheap and easy dish, so what’s not to love? Put the grill on. Get all your ingredients ready. Remove the ends of the courgettes with a knife. Slice them with a knife and chopping board, or with a mandolin (slicer), or with the thick slicer on your food processor. They should be sliced into 1/2cm slices. Put the courgettes into a big salad bowl and pour the olive oil over them. Crush the garlic with a garlic crusher and season to taste with salt and black pepper. Stir well with a big spoon or your fingers, making sure that everything is well coated with oil or it might burn. Cover a large baking tray with some foil (this is mainly to make the washing up easier later!) Evenly spread the courgette slices over the foil, then sprinkle the grated cheese over the courgette slices. Put the baking tray about 10cm below the grill. If it's too close the cheese will burn quickly and the courgettes will still be very crunchy. If it's too far away... it will never cook! Grill everything for about 25 minutes or until the cheese is properly gratiné (grilled) like in the picture below. You can replace half of the cheddar cheese with some grated mozzarella cheese so it's creamier and softer. It’s really yummy, and one way to get the non-courgette eaters in the family to give them a try! We keep trying to cut back on our meat-eating too, but it’s hard when both Ben and I were brought up in big meat-eating households, old habits die hard and all that! Oh my, absolutely delicious. I want to come round so you can cook for me-I’ll bring cake! 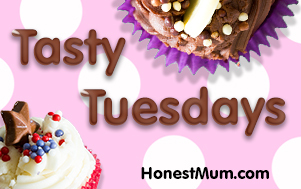 Thanks for linking up to #tastytuesdays. Hope to see you tomorrow!